If you find Windows Range Manager installed on your computer, you need to think carefully if trusting this program is the right move. According to our research, this potentially unwanted program (PUP) is quite intrusive, and it can send data about you to its own remote servers without your notice or permission. On top of that, it is possible that this PUP might be responsible for showcasing ads that represent the services or products of unknown parties. Needless to say, this program is extremely suspicious, and trusting it could be dangerous. Due to this, we strongly recommend removing Windows Range Manager from your browsers without further delay. If you have no idea how to get rid of this potentially unwanted program or why this is even necessary, we welcome you to read this report. If we fail to answer all of your questions, please post them below, and we will address them as soon as we can. 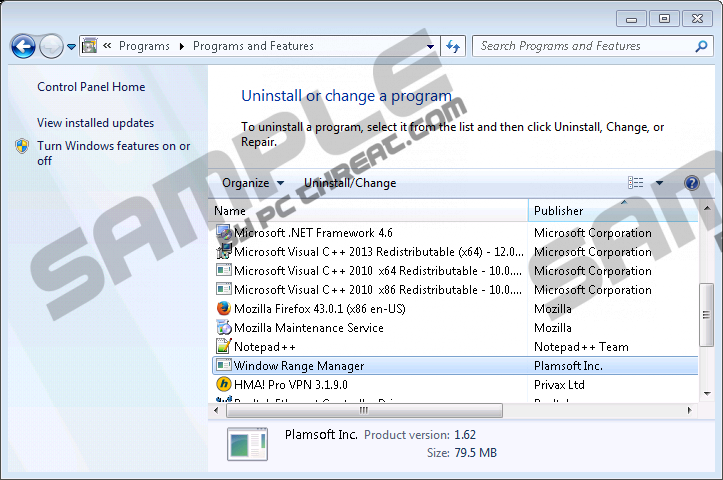 According to our research, in the past, the official installer of Windows Range Manager was available at rangesoft.org. However, at the moment, this website represents Online Ad Scanner; although, the download link does not even work. This suspicious program is introduced as an advertising tool, and it is most likely targeted at service/product/content creators who are looking for new advertising solutions. This program supposedly analyzes traffic data to help discover advertising trends and collect useful information. Is it possible that Windows Range Manager is using the services of this suspicious advertising tool? It is possible, but we do not know for sure. The files of the PUP itself are signed by Range Soft, and it appears that it is spread via bundles that come from rangesoft.org. The sample we have tested was published by Plamsoft Inc., but it is possible that different parties will be responsible for distributing this strange application. Since Windows Range Manager travels in bundles, it is possible that other malicious infections are present on your operating system. Do you “see” no malicious threats? Not all unreliable programs and infections are noticeable, and not all of them “look” dangerous, which is why you cannot make any assumptions just by looking at certain programs. We suggest using a malware scanner to inspect your operating system, and it is possible that you will discover malicious threats. If you choose to eliminate them manually, assess them carefully to decide which ones deserve your attention first. Although we advise deleting Windows Range Manager as soon as possible, you might encounter much more dangerous threats. Of course, you cannot underestimate the PUP itself because it might be capable of spying on you and potentially exposing you to unreliable parties. Whether or not this program is capable of collecting and leaking personal information is unknown, but this risk needs to be computed as well. Have you discovered that more advertisements have appeared after the entrance of Windows Range Manager? As mentioned already, it is possible that this PUP will initiate the injection of ads, and we do not recommend interacting with them. After all, you do not know who stands behind the advertisements shown to you, and you cannot be sure that their intentions are good. In fact, it would not be surprising for an unreliable, unpredictable PUP to be involved with malicious and untrustworthy advertisers. In the worst case scenario, malware creators could exploit this program to expose you to malware, and you do not want that. In case you have already clicked on suspicious ads, think if you might have been scammed or if you might have exposed your operating system to unreliable parties. Needless to say, Windows Range Manager is a suspicious and intimidating application, but we have good news. This PUP is very easy to get rid of, and all you need to do is uninstall it. We have created a guide that is very easy to follow, and you can use it to eradicate this potentially unwanted program from your PC quickly and efficiently. This is another time when we advise running a full system scan. Even if the first scan has not revealed any additional threats, you want to scan your PC to see if the PUP was fully removed. If you do not want to spend your free time scanning your system, researching all active threats, and eliminating them manually, you can employ an anti-malware tool that will take care of all malware-related problems, including the further protection of your operating system. Select Control Panel to open a menu with more options. Open the Control Panel menu. Go to Uninstall a program and find the unwanted app. Launch RUN by tapping Win+R keys at the same time. Type Control Panel and click OK to open a menu. Right-click the unwanted app and select Uninstall. Quick & tested solution for Windows Range Manager removal.